Blue anodized aluminum handles are well knurled with an excellent grip. The length of the handle is 4" and features a steel easy-release chuck, which presses into the barrel and remains secure. Handle will last a lifetime. Made in the USA. A 12-piece file set which contains the most popular shapes in a handy plastic pouch. Files come with knurled handles.Excellent quality. Available in cut #2 only. Length 5½". A set of 10 double-ended rifflers with square handles for use in tight places and for filing odd shapes. Overall length: 7". Available in medium cut only. Metric and English scale micrometers with friction stop; comes in a padded plastic case. Model A: Calibrated to read 0 to 25mm, in 0.01mm divisions. Model B: Calibrated to read 0 to 1", in 0.001" divisions. Double scale vernier caliper. Nickel Plated Scale. Readable on the vernier scale to 1/128" and/or to 0.1mm. Has a roller adjustment and it is packed in a plastic case. These precision vernier calipers are molded in corrosion resistant fiberglass-filled super-polyamide nylon alloy. They are excellent tools due to there easy reading scale (black numbers on white background) and dials (light weight, fine adjustment thumb roller). Its parallel jaws are 1.57" (40mm) deep, and its reading scale does not create a parallax. Its inside-outside jaws and round metal rod depth gauge add to its value. Overall length: 8¾" (213mm). B Dial type, 0.1mm dial, 1.3" (33mm) diameter, maximum reading 150mm, 10mm bar scale. Function: zero setting, data hold, low battery alarm and data output. Provided with a data saving output port for connection with the SPC system. Powered by a single SR-44 battery. Battery life: approximately two years under normal use. This caliper is made from stainless steel and measures inside and outside in inches and millimeters. Read-out from 0 to 6 inches with 0.001" resolution, or 0 to 150 mm with 0.01mm resolution. Includes a zero set button, depth measuring rod and a fine adjustment thumb wheel. A protective carrying case and battery are included. 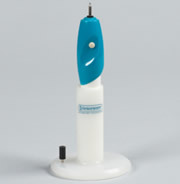 Sturdy scribers are in wide use throughout the laboratory. It leaves a permanent marking on virtually any surface, including metal, glass, or plastic. Each Scriber features a hexagonal aluminum pencil shaped body, mill finish, natural diamond tip and protective cap. Different styles are available to fit all of your needs. Overall length 6", Shank Length 1/8", Handle ¼" x 5½", 60° tip finish. These stones are natural with close density oil-tones, and excellent qualities that make them the stone unequaled for sharpening tools such as gravers, knives, etc. Comes in a cedar wood box and they are available in two types: translucent (extra fine); and hard (fine). This diamond stone has millions of cutting edges to sharpen most any tool. Many times faster than dry or oil stones. May be used as a file or a stone. It cuts in all directions. Available in all purpose fine grit. This patented process of heat treatment which bonds the highest quality industrial grade diamond particles in a stainless alloy to a precision matched metal substrate, has been imitated, but has never come close to being duplicated. 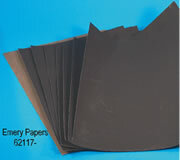 Emery paper which is glued to a wooden handle. 11" long x ¾" wide (279x19.1mm). Very useful for filing excess resin of sample block tips. Grit size ranges from number 4/0 (finest) to 3 (coarsest). A plastic handle, 10½" (267 mm) long, holds strips of emery paper or cloth 11"x1" (279x25.4mm). Strips are easily replaced. Comes complete with 2 strips/set (grit 120 and 240).